Sixteen years ago at this time, I was great with child. (Now, I'm just great without child...ba dum dum). I was 37 weeks pregnant at Christmas and it all had me rather captivated with thoughts of Mary. With thoughts of that first Christmas and how it must have felt for her...what she must have been thinking. 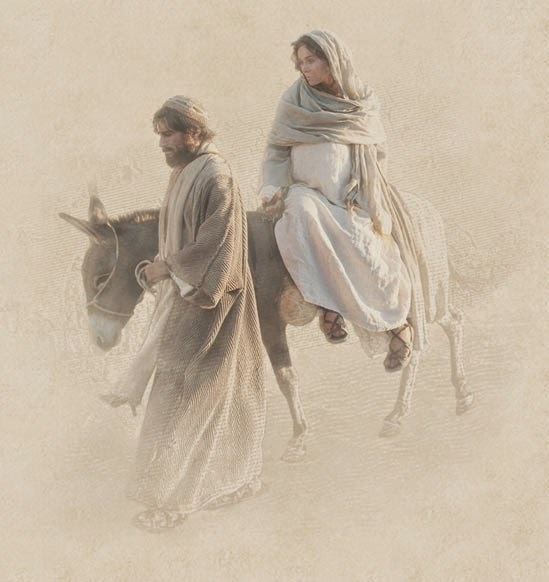 High on my radar was how incredibly uncomfortable she had to have been on that journey to Bethlehem. I struggled to get in and out of a car. Much less walking or riding on a donkey. Mary. The mother of our Savior. Revered. Adored. Even worshiped by many. Which, to be honest, I don't think she would be happy about or desire. Because she called herself the Lord's servant (Luke 1:38) and she rejoiced in God for being mindful of "the humble state of his servant" (verse 48), and then she offered all praise to the "Mighty One who has done great things for me." She did not consider herself great or special or deserving. Quite the opposite as her song to the Lord in Luke 1 demonstrates her praise and humility before God alone, as the One who extends mercy and performs mighty deeds. Yet, Mary has become an object of adoration nonetheless. When I think of inspiring Christmas carols, I can't help but ponder the Amy Grant classic Breath of Heaven. It offers such an intimate picture of Mary's perspective on all the events that unfolded that first Christmas season. The Christmas song was originally written by Grant's band mate, Chris Eaton. Grant needed a song for her Christmas album and coaxed Eaton into letting her rewrite the lyrics so that it became something of a prayer reflecting Mary's thoughts. Interestingly, Grant penned the new lyrics while pregnant, saying that her condition gave her fresh insight to Mary's perspective. I knew Amy Grant and I are pretty much the same. Breath of Heaven. Mary's thoughts as she traveled, humbled and confused, with the son of God within her. Consider the lyrics below. This Christmas, I have made a concentrated effort to truly consider, for the first time, the Advent season. I have been attempting to be intentional in studying the Scriptures about that first Christmas and to prayerfully prepare my heart to fully embrace the meaning of this season. So, I have spent this month in the book of Luke. And, as God often does, I have been directed to Luke through various other means, as well. Never have I really paused for this long, with this much intention, on the nativity story. Never have I prayed this frequently for God to reveal to me all the significance of Christmas so that I wouldn't overlook a thing. And in that frame of mind, I listened to this song the other day. And it hit me like a ton of bricks. We revere Mary. She went from being an unknown teenage girl to a figurine placed in nativities all around the world. Beyond a household name. Mary. Just a normal girl. Chosen by an Omnipotent God to complete his purposes for her. And through him, he would work out his greater plans. Chosen to carry his son. Certainly, as we see from her song in Luke 1, she likely would have questioned if God might have chosen one wiser or older or more equipped. Certainly we see in Luke 1:48 that she grasped at least to some degree the significance of her task, saying that all generations would call her blessed. Not because she was so amazing or worthy on her own. But because God dared to do the supernatural and extraordinary through one so ordinary. I think one of my greatest moments of epiphany this Advent season is tied to this song. Because we revere and celebrate Mary since she carried God's son inside of her. Yet, we, as followers of Jesus, have been given the Holy Spirit inside of us. We, too, carry him within us. We, too, are ordinary and normal and insignificant. We, too, are nothing special particularly on our own. So, we are awed by how God chose the ordinary Mary to complete his incredible purposes and plans. We place her little figurine near the manger and we sing about her and some of us even worship her. But, aren't we Mary? Didn't he choose to change our destiny by offering each of us his son? Doesn't he have eternal and extraordinary plans and purposes for each of us? If in doubt, see Jeremiah 29:11 or Ephesians 2:10. Aren't we, too, the bearers of the image of Jesus? Called by his name? Equipped by the Eternal God to be part of the incredible story of mankind that he is writing every day? Didn't he also reach down from heaven and intersect our routine and ordinary life in order to give us a greater purpose for eternal plans? When did we cease to be in awe of this truth? How do we lose sight of that miracle? Why do we allow the incredible role we play in God's kingdom to become mundane and trite? We marvel at Mary. But we are just like her. Human. Going about our business with our own plans for the future. And God reaches in and shakes it all up. He offers each of us his son, within us. He offers to equip every one of us for the mind blowing plans and purposes he has for us. Just as the Mighty One did great things for Mary (Luke 1:49), he does great things for us. Every day. The hope for eternity. The grace to cover all our mistakes and sins. The love that changes everything. The power to complete what he calls us to do. The opportunity to be part of his glorious eternal story. Reread the lyrics above and see them as your own song. Your own prayer to the Heavenly Father. Your own humility to be chosen by Him and wondering if he might have chosen one wiser. But awed and humbled that he chose you. May we call out to him to hold us together. To be near us. To equip us to carry the load he calls us to, which he promises is a light burden and an easy yoke (Matthew 10:39-42). And this Christmas season, may we be as Mary. Crying out to him, offering him all that we have for the mercy of his plans. Asking him to help us be strong. And realizing that because of that first Christmas so many years ago, we can dare to call on the name of Jesus. Because the breath of heaven came near. To lighten our darkness. And call us his own.